Brands like Apple and Samsung have been ruling the market with their flagship smartphones but when it comes to Motorola, it has bossed this section. It has been more than six years that Motorola has been adding new gadgets to its G family. This is due to the fact that no one else makes the desirable, well-rounded smartphones anymore. With a legacy in their mind, Motorola one was launched in Europe, Latin America, and Asia back in October with a distinctly iPhone X-style notch. There are two phones in the segment by the name of Motorola One and Motorola One Power which is a little bigger and more powerful. During the time of the launch, Motorola promised to roll out the latest version of Android which is expected to come in the starting of the next year. Both the smartphones are also the part of Google’s Android One program which promises at least two OS updates. If that is the case, the devices should be getting an Android Q update next year too. The Motorola One creeps into the lower end of the mid-range territory, though is better value in the UK than the US. Motorola describes the smartphone as “Smart, Secure, and Simple” which is a trio refers to one thing: Android One. The US FCC listings about Moto G7 Power were first identified by the XDA developers. The US FCC listing has given several hints about the dimensions, battery, distinct features, design details, functionality and connectivity options of the handset. 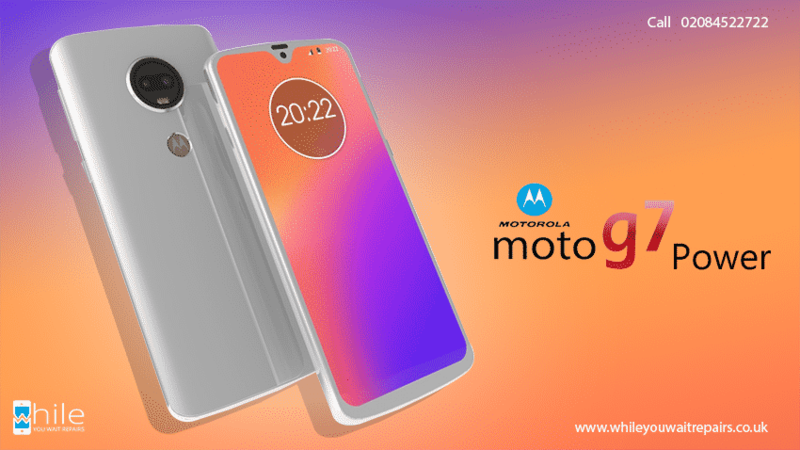 The Moto G7 Power will carry the model number XT1955-4 and the grand revelation that Moto G7 Power will have a massive 5000 mAh battery is a definite reason for excitement. Adding to this highlight, a few dimensions have also been revealed. The handset measures 159 × 76 mm and measures 167 mm diagonally. The phone will include a 2.4 GHz WLAN antenna and a BT antenna on the top. It will also support the WWAN antenna in the bottom. There is a schematic representation of the handset that has a single rear camera. Other details like the connectivity options are given by the US FCC listing. This suggests that the phone will have Near-Field Communication (NFC) support in certain areas. The phone will be reportedly released in four variants for different markets. •	The model number XT1955-4 as specified above will not support NFC. •	The variant XT1955-1 is for the Brazilian market. •	The model number XT1955-2 is for Latin America. •	The variant with model number XT1955-7 is designed to support NFC, unlike the XT1955-4. These are the features of Moto G7 Power as of the FCC listings. The Moto G7 Power will use the Octa-core processor. Along with this, the stunning handset is expected to come in 3 different RAM options. They are 2GB, 3GB, and 4GB. The inbuilt storage options could be 32GB and 64GB internal memory. Another widely rumored feature is about the camera pixels. The Moto G7 Power may have a 12-megapixel rear camera with f/2.0 aperture. The front camera will have an 8-megapixel front camera with f/2.2 aperture. The Moto G7 Power has got amazing camera features that include Cinema graph mode, spot coloring. The single rear camera will be able to capture bokeh shots too. The handset will not run on Android One but will support the Android 9.0 Pie out-of-the-box. The color options specified for the Moto G7 Power are Silver, Black, Blush, and Indigo. The price of the handset is yet to be revealed. The Moto G7 Power will have a 6.22-inch full HD+ display along with a notch. It is also rumored that the phone will have Turbo Charge with fast charging technologies. The will also be a fingerprint sensor for security. These factors combined should push the Moto G7 Power’s battery life well into the two-or-more days range while maintaining the affordability that the Moto G series is known for. The battery life also lines up with the company’s previous Power variant phone, the Motorola One Power, which promised a two-day battery life, but only launched in India. The Moto G7 Power’s FCC listing should be a strong indicator of its future arrival stateside.